If anything has come out of my six-month commitment to the Food & Wine 2012 Cocktail Book it is a new appreciation for The Negroni. Quite frankly, prior to this project I didn’t even know what a Negroni was nor did I have a signature cocktail. I was leaning towards a gin-based cocktail, but it wasn’t until that fateful day in the test kitchen when the stars aligned and I found my one true love…cocktail love that is. Unfortunately I’m a little late on The Negroni bandwagon. This past year was deemed ‘Year of the Negroni’ by the Camapri brand. 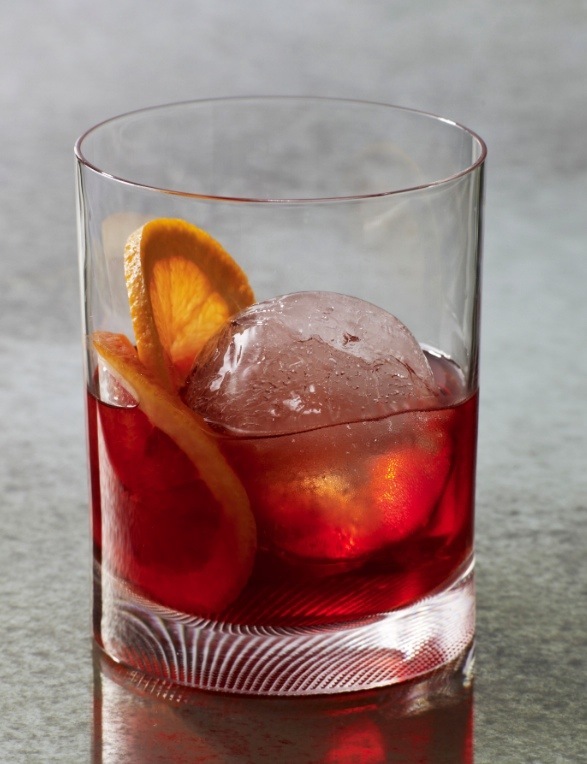 Classified as an aperitivo, an amari or even a bitter, Campari is made from more than 60 ingredients, including herbs and botanicals like orange peels, rhubarb, wormwood, pomegranate, quinine, clove and ginseng. And for clever publicity they created a whole year to celebrate this supporting-role ingredient to the classic drink rising from the cocktail Renaissance. Nowadays the all the cool kids are throwin’ ’em back. There is a bar called Jasper’s Corner Tap in San Francisco that even serves them on tap! Giada De Laurentiis was sipping on one at Meatball Maddess this past year as Campari was one of the sponsors to the event. For me, the only way I can develop a taste for something is if I force it for a little while in the beginning and then I eventually come around. (For all who know me I will NOT be trying this technique with truffles. I do hope to one day try this with Whiskey.) In my early 20s I went to one of those beer festivals and had to drink my $50 admission fee worth in beer. You just get on a line and hope it’s good. When you go through college drinking the cheap stuff it’s a little bit of a leap to find a taste for some well crafted beers, that I now can’t live without. Recently I’ve learned to drink coffee black, mostly because I can’t keep milk around long enough between one weekend to the next when I want a cup of coffee after rolling out of bed at 10AM. Also the milk situation at Food & Wine is a little temperamental and boy do they like their coffee strong. So alas my love for bitters is born! A final contributing factor to my love of The Negroni is it’s Italian roots. There is something familiar about the bitter aromatics that soothes my soul. It brings me back to a former life when I lived on a farm on the Italian countryside and tended to chickens, rolled pasta by hand and had dried meats and peppers hanging form my porch. And the only remedy for a hot day in the Sicilian sun was a swig of gin, sweet vermouth, and Campari with a fresh orange peel from the tree in the yard. Below is the recipe for my hearts content. But let me warn you it is VERY easy to screw up an equal parts cocktail. A bad gin or a sweet vermouth that hasn’t been refrigerated or even the slightest mis-proportion can throw the whole thing off. I mean if you want a little more gin or whatever go for it, but be careful with the vermouth. Over New Years in Puerto Rico I had my fill of sweet rum cocktails and asked three times for the bartender to make me a Negroni. I was ready to jump over the bar in my mini skirt and high heels and take over. Also, The Negroni is best served with a large chunk of ice (as seen here) as to not dilute but still keep it cold. Happy Drinking! Fill a cocktail shaker with ice, add all of the ingredients except the garnish. Shake well and strain into a rocks glass. Serve over a large piece of ice and garnish with the orange twist.